« But will the buffalo roam? A yak is not a bird. Don’t know why I ever thought it was, but in my mind, it was big, dumb, and ugly like an ostrich or emu. This lesson came from a recent humorous debate between my husband and I – it turns out he’s right. They are closer to a cow than a bird. I can also say I’ve never actually seen one in real-life and I don’t consider it a loss. Don’t laugh at me — I know someone who didn’t know what a mole looked like for the longest time. 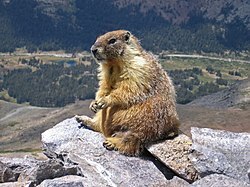 This is what a marmot looks like (thank you to Wikipedia for knowing and having images of almost all things important). The “mole person” from above will now need to either determine what was in the yard or come up with another undefined animal name to call the mystery creature. I look forward to the discovery either way. Contrary to what I was taught in grade school, the buffalo may indeed have been driven TO extinction, but they are not ACTUALLY extinct. In fact, they are ugly and thriving in the mid-west as well as the Ted’s Montana Grill down the street (not so much thriving there). I learned this first-hand during a stint in Oklahoma. Longtime residents of the area were astounded and thought me insane to have believed these animals were extinct. I don’t think someone born, raised, and never having left the state has a basis for determining the sanity of others. With that said, I don’t necessarily doubt their questions about my sanity. To address the inevitable PETA flames, I offer the following disclaimer: To my knowledge, I have never eaten any of the animals mentioned on this page either with or without any type of seasoning. Happy Hunting! This entry was posted on May 14, 2008 at 6:01 pm and is filed under Ponderings. You can subscribe via RSS 2.0 feed to this post's comments. You can comment below, or link to this permanent URL from your own site. I think it was a marmot. Although the brown furry thing in the yard didn’t pose quite as well as the one posted here, it is similar enough that the theory of it being a marmot still stands. There’s a cat under the porch, can you get it out?